The Cubs will be devine in 2009! The Cubs will soar in 2004! The Cubs will glow in 7-0! The Cubs will be thunderous in 71-derous! The Cubs will be heavenly in 67ly! The Cubs will come through in 72! The Cubs will be great in 68! The Cubs are going to win in 2010! Ernie singing "Hey Hey, Holy Mackerel"
Mr. Cub has a pretty good golf swing!! 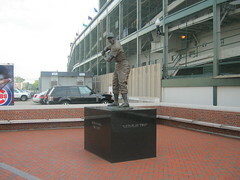 Ernie Bank's statue has the apostrophe added to Mr Cub's slogan "Let's Play Two"